My brother turned 30 last month. To celebrate, a small group of friends went on an insane/stupid bushwhacking adventure up Pup Creek. Because, for some reason, that's how my brother likes to celebrate things. We started out by wading across the Clackamas River. If you're not familiar, the Clackamas is no joke and crossing the river was probably the most dangerous part of our entire expedition...probably. Then we scrambled/waded up Pup Creek to a magnificent two-tiered waterfall. Pup Creek Falls is spectacular and we didn't see another person all day. Try to imagine standing at the bottom of a 200-foot waterfall. Looking almost straight up, you can see the top of the cliff where the falls originate. On either side of you is the and insanely steep valley (or is canyon a better word?) walls cover in trees and ferns. Behind you, Pup Creek continues winding gradually downward toward the Clackamas. Now imagine that your goals is to get past this waterfall and continue following the creek upstream. With no ropes or climbing equipment, you can't go straight up the cliff face. You only have one option: ascend the valley wall to get around the waterfall. It's difficult to convey just how steep this section was. We weren't truly climbing like you would climb a rock wall, but we definitely weren't hiking either. It was a kind of exhausting clamber that required both hands and feet as you pushed uphill, through underbrush and over fallen trees. When we finally made it up, over, and back around to the creek we happily returned to relatively pleasant task of scrambling upstream toward the second waterfall. And that is when I started thinking about the lessons I could take away from this experience. I had plenty of time to think as we repeated the struggle I described above in order to see two more waterfalls and all the way back down for six exhausting hours. Lesson 1: Doing hard things makes everything else so much easier. Near the end of our return journey, there was a point where we came across the trail. After "hiking" on what seemed like a 70° incline through underbrush and over logs for several hours, it was a pretty odd sensation to set foot on an actual trail. It was so easy. It sounds like an exaggeration, but it almost felt like I wasn't even walking. Even on level ground, I seemed like I was going downhill. This same phenomenon can occur any different areas of life. Think it's hard to publish one podcast a week? Try committing to a one-month blitz of publishing daily, like the guys over at Listen Money Matters did. You'll get better at podcasting, hone your process, and become much more efficient. You'll also learn just how doable it really is to publish once a week by broadening your self-imposed limits. Lesson 2: Doing hard things expands your comfort zone. I have what I consider to be a healthy fear of heights. I'm not an especially strong swimmer, so cold, rushing water isn't really my thing either. But I wasn't going to be the one to ruin the fun so when we had to cross the river, I fell in line and did just that. And when we had to traverse the steep valley walls, I charged ahead to lead the way. As the day went on, my courage grew; my brain adapted to what I was imposing as the new normal. I expanded my comfort zone. You can do the same thing. Maybe you have a fear of public speaking (most of us do) or you're intimidated by that complex new editing software. The best way to get comfortable is to jump right it. I'm not saying you have to give a Ted Talk next week or anything, but look for opportunities to talk in front of people. Even something as simple as speaking up in a work meeting or putting yourself out there on Snapchat can start you down the right path. Lesson 3: Doing hard things builds confidence. After our off-the-beaten-path adventure, I didn't feel like there is a hike out there that I couldn't handle. Before, a six-hour hike would've sounded pretty daunting. Now six hours on a trail sounds like nothing; I mean, I've done it without the trail. Doing something that really challenges you continues to pay dividends for a long time. You can feel confident that if you're put in a sink-or-swim scenario, you can thrive. You can step outside of your comfort zone and figure things out. If harnessed properly, that confidence can have a powerful compounded effect throughout your life. Lesson 4: Doing hard things helps you stop taking things for granted. When we returned to the car at the end of the day, I sat down with a gatorade and a day-old breakfast burrito; it was GLORIOUS. This may come as a shock, but old burritos and gatorade aren't normally at the top of my list. When you've been uncomfortable, hungry, and thirsty for so long, things go from "meh" to "YASSSS" pretty quickly. If you've been putting in long hours and losing sleep to meet a tight deadline or ship a big project, I guarantee that you will gain a new appreciation for free time and a good nights sleep. Discomfort has a way of bringing things back into perspective and reminding you to be thankful for what you have. Lesson 5: Doing hard things is fun. 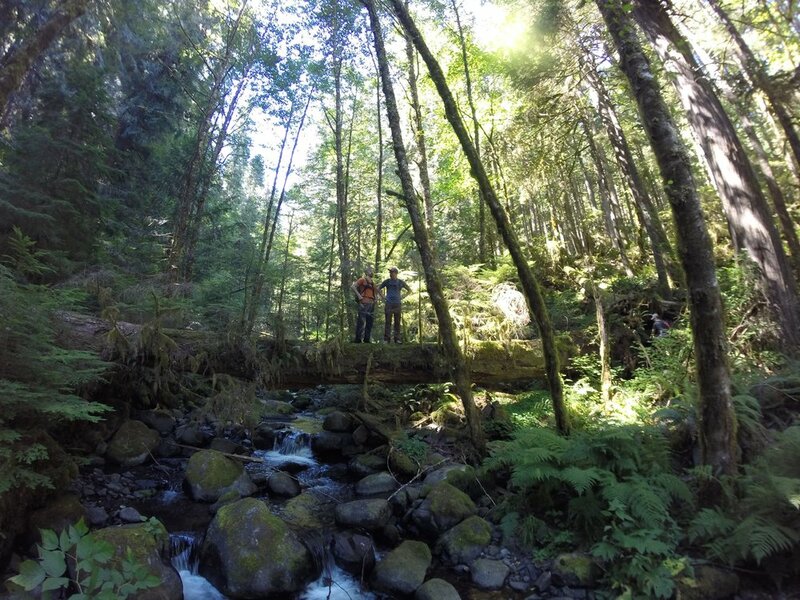 It may seem like I've been doing a lot of complaining about this bushwhacking adventure, but the truth is that it was a total blast; one of the best days of the summer. Being surrounded by nature, celebrating my brother's birthday with a few friends is an awesome way to spend a Saturday and we made memories that will last a lifetime. Hard work and discomfort have some negative connotations, but there is joy and satisfaction in the struggle if you're open to it. Deep down, we all want a challenge. In fact, one of the top reasons for dissatisfaction at work is that we don't feel challenged. The process of tackling a really tough, new problem is extremely stimulating and it is deeply satisfying when you finally overcome that obstacle. Do hard things to make yourself happier and enjoy life more fully. Lesson 6: Doing hard things is better with friends. This hike was an incredible experience and I really enjoyed it. But if I had gone through it on my own, it probably would've sucked. I would have been overwhelmed and I never would have gone so far if I wasn't surrounded by people on the same journey. Tackling this challenge with friends made all the difference. We took turns leading, we made stupid jokes along the way, and we encouraged each other just by being there, pushing toward a common goal. If you wan't to set and accomplish a hard goal, I would encourage you to find a partner or close group of allies to work alongside. Even if their goals aren't identical to yours, it's important to have someone "in the trenches" with you. Having someone to give you connection, accountability, and just make the struggle more fun is invaluable. Doing hard things can be pretty unpleasant. But I promise that if you commit to challenging yourself, you will make progress and feel more fulfilled. What is one area of your life where you want to improve? Come up with a lofty goal and embrace the struggle, you'll be glad you did.